A note has been written on the reverse of this hotel advert. 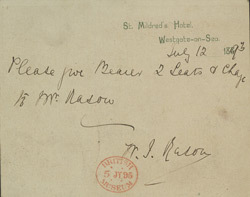 It reads: "Please give bearer 2 seats and charge to Mr Mason", and is signed by Mr Mason. The seats mentioned are likely to be for one of Evanion's performances.